You’ve seen the ads or heard the pitches trying to persuade you to put money in “offshore” ventures such as the AdViewGlobal, AdGateWorld and MegaLido autosurfs. You’ve been told they were safe. You’ve been told the people who run them are out of the reach of U.S. securities regulators and law-enforcement agencies. And you’ve been told your investment, which the surf purveyors call an “advertising” purchase, provides shelter from the FTC, the SEC and state attorneys general. Don’t tell John and Marian Morgan of Florida that “offshore” means “safe” and that “offshore” provides a blanket of protection from law enforcement. And don’t tell it to Jeffrey Lane Mowen, either. John and Marian Morgan were charged by the SEC in June with running a prime-bank scheme. They skipped the country rather than appear for a hearing in July, first going to Europe and later to Sri Lanka. Guess where they are now? John and Marian Morgan are in separate cells in a U.S. jail. In addition to the SEC’s civil charges, they now face criminal charges after being indicted by a federal grand jury. They did not outmaneuver the SEC. They did not outmaneuver the U.S. Marshals Service. They did not outmaneuver the FBI. They did not outmaneuver the IRS. They did not outmaneuver Interpol. Nor did John and Marian Morgan outmaneuver the government of Sri Lanka. 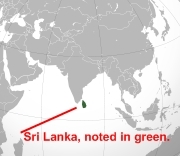 They were arrested and jailed on the island, which is situated about 20 miles off the southern coast of India, in August. Sri Lanka deported them, and the United States brought them home earlier this month. Do yourself a favor and read this story in the Sarasota Herald Tribune. Longtime opponents of the autosurf “industry” — in this upside-down world, the opponents are called “naysayers” and the Ponzi advocates are called “leaders” — will recognize the utter absurdity. Sadly, though, most of the “leaders” likely will be too busy “leading ” the troops to even bigger and better catastrophes to take the time to read it. Or they simply won’t care because leading people into catastrophes pays too well. If you missed it earlier, take the time to read this story on how the FBI brought home Jeffrey Lane Mowen from Panama to face charges in a Utah Ponzi case that now has morphed into murder-for-hire investigation. John and Marian Morgan are in separate cells in a U.S. jail. In addition to the SECâ€™s civil charges, they now face criminal charges after being indicted by a federal grand jury. They did not outmaneuver the SEC. They did not outmaneuver the U.S. Marshals Service. They did not outmaneuver the FBI. They did not outmaneuver the IRS. They did not outmaneuver Interpol. Hope that a few people will take note of this. What is truly funny is we keep telling people it is a “MYTH” that being offshore protects you from U.S. federal and state regulatory agencies, but some refuse to believe it. With more and more of these cases coming to light it just might wake them up it really is a “MYTH.” But some will never learn, and continue to believe the “MYTH;” and of course lose their money. Aren’t we humans goofy at times? LOL! I wonder of the folks at AVGA have figured it out yet? ?